This is the story of how you can build a unique shed out of salvage, imagination and hard work. In the UK, you get a puzzled look and a discouragingly high estimate when you ask about having a corrugated iron shed built. Various friends helped her dig a really deep hole, ‘in return for hearty lunches’. Then she paid a professional to make a flat, stable concrete base. 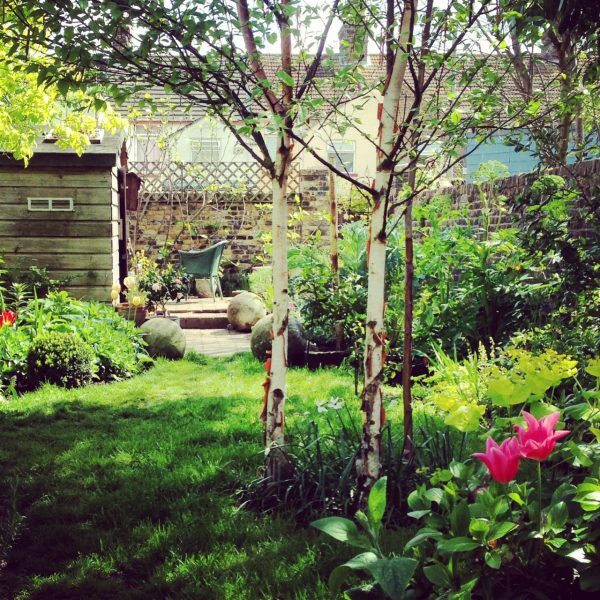 For more about why the base of your shed matters, see here. Posy collected old bricks. She bought some and was given others as leftovers from friends’ projects. Her house is yellow Victorian brick so she more or less matched the shed up. Another friend taught Posy brick-laying. It was during one of the hot spells last summer, so she mainly laid the bricks at 6am. The shed only needed three walls, because the fourth wall was the back wall of the garden. The brick layer is about six bricks high. It creates a sturdy base to protect the wood from rot. 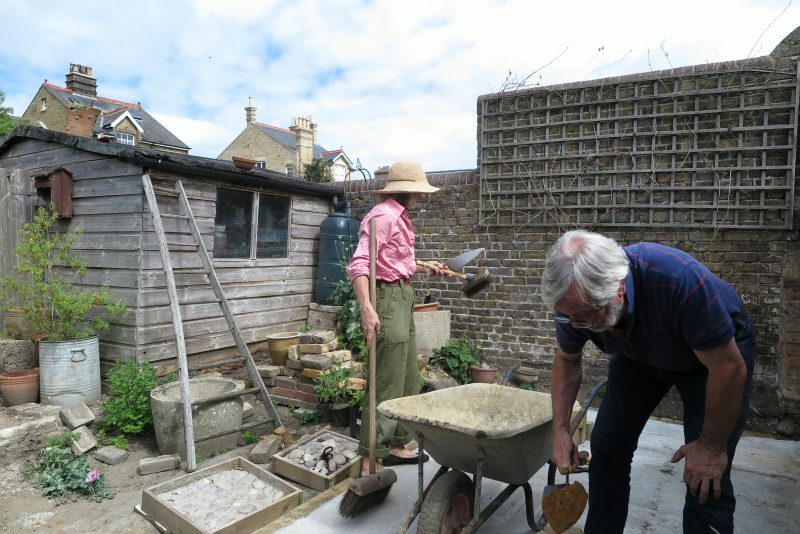 Posy admits that the brick-laying isn’t perfect, but it’s good enough for a garden shed. Ian teaches Posy brick-laying. You can see the old garden shed behind them. The next stage was beyond an amateur. Posy engaged builder-carpenter Dave Souter to knock down the old shed. He re-used the boards to make the new shed. Many of the planks were rotten, but there were just enough to make the new shed. It helped to have the brick layer, and also that the garden wall was the back wall. 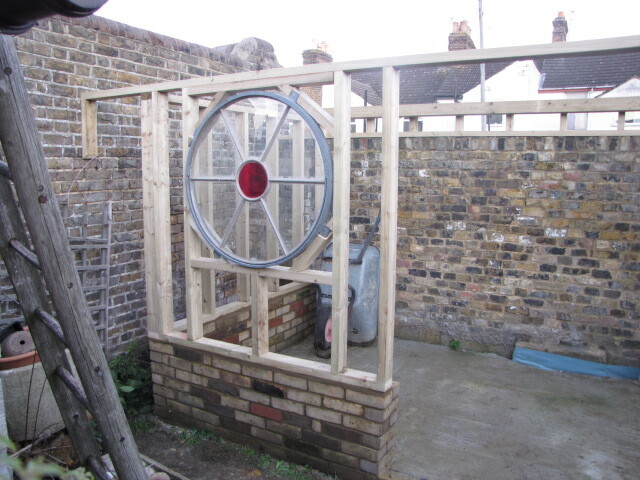 Put the salvaged window into the frame, and the frame on the bricks, then the wooden planks get added later. 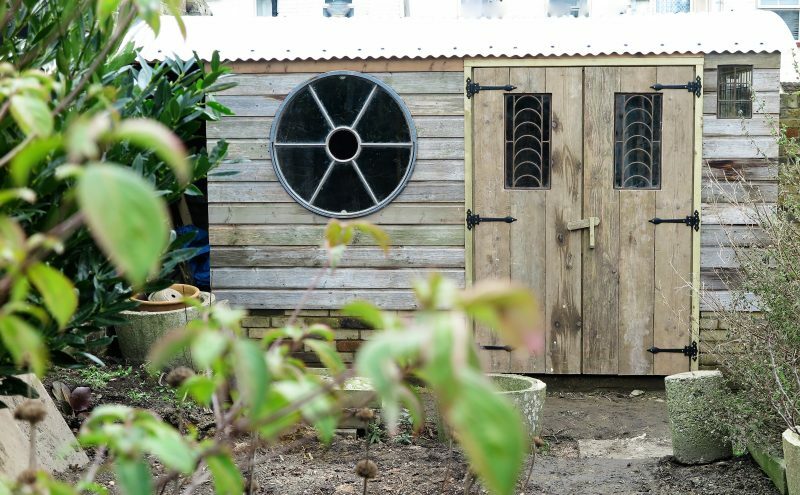 Another friend gave Posy some old windows, and Dave built the shed around them. He also sourced vintage scaffolding boards to make a door. 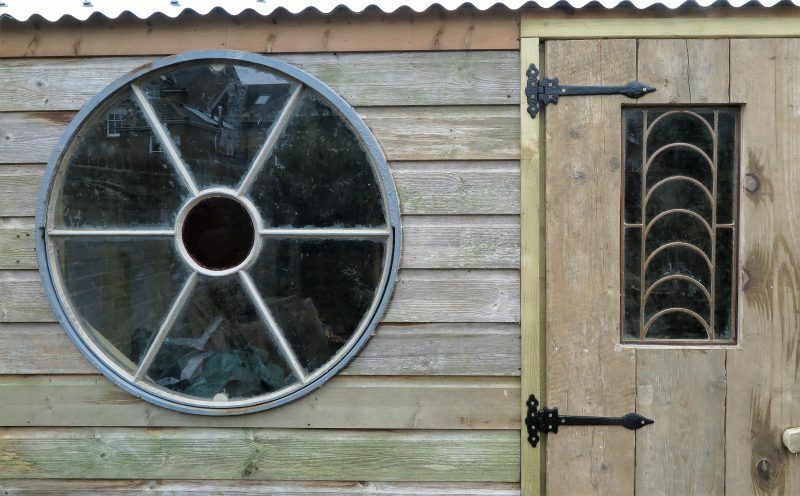 The windows were a gift from a friend, and Dave salvaged the old shed to make the new one. You can see that the doors are made of old scaffolding boards. Posy sourced some curved corrugated iron for the roof. She bought it new and it cost several hundred pounds. Dave Souter roofed the shed with it, and gave it some guttering round the back. 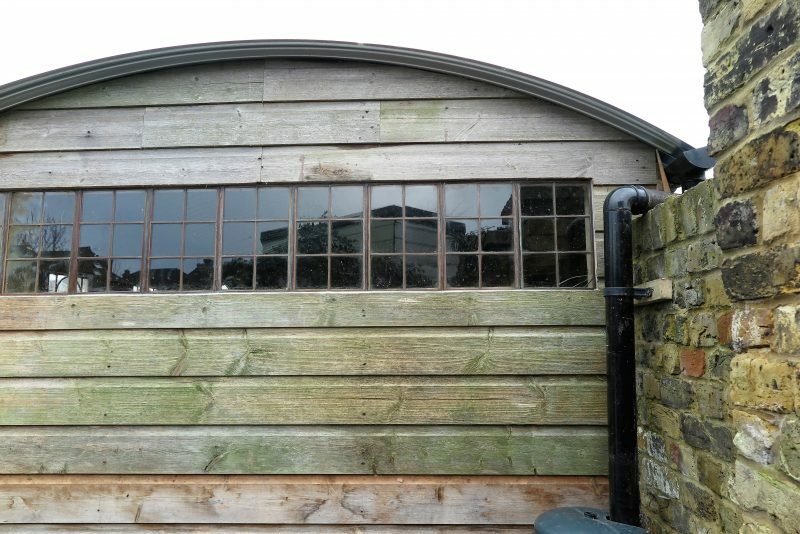 The completed shed with its corrugated iron roof, salvaged windows and scaffolding-board doors. 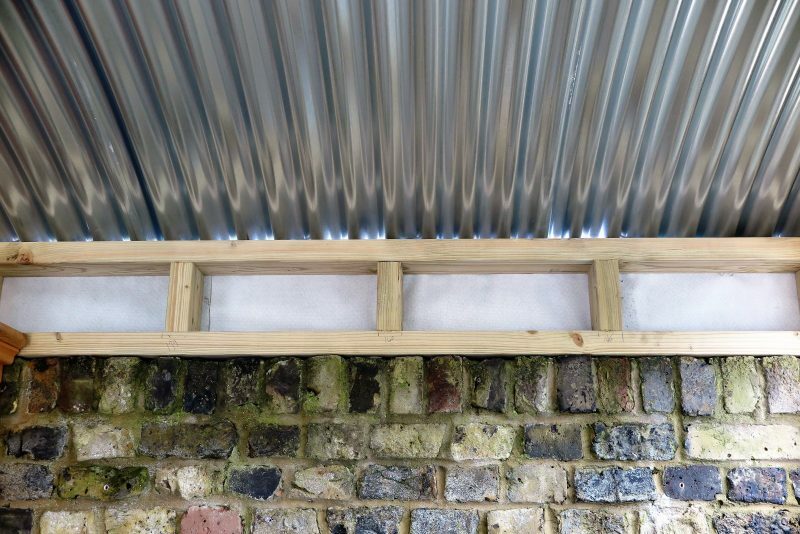 A view from inside – the corrugated iron roof, sitting on a small frame, then the back garden wall. The side view shows the curve of the roof, and another salvaged window. I can definitely say that corrugated iron has taken over from snowdrops as the most difficult thing to photograph. It’s so shiny that it disappears in the sunlight. But I hope you get the idea. 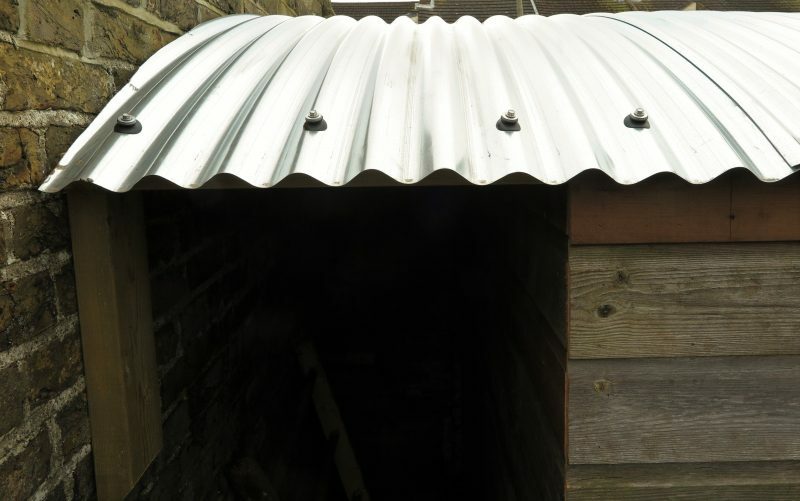 A detail of the roof, which creates a small covered storage area to the left of the shed. So how long does it take to build a shed? What with the ups and downs of life, it took nearly a year to build this shed. Posy took a break from it when money was short. And because friends helped, some things could only be done when they were free. It’s a beautiful and unusual shed. It’s big enough to insulate, so perhaps Posy could make it more of a room one day (although sometimes sheds are more useful than more rooms!). With all the stopping and starting, it’s difficult to calculate the cost, but Posy estimates that it was somewhere between £2,000 and £3,000. Posy’s shed was finished two weeks ago. And then I went to the Garden Press Event, where the Posh Shed Company launched The Tin Hat Shed. There are two models: The Andersen and The Gardener. 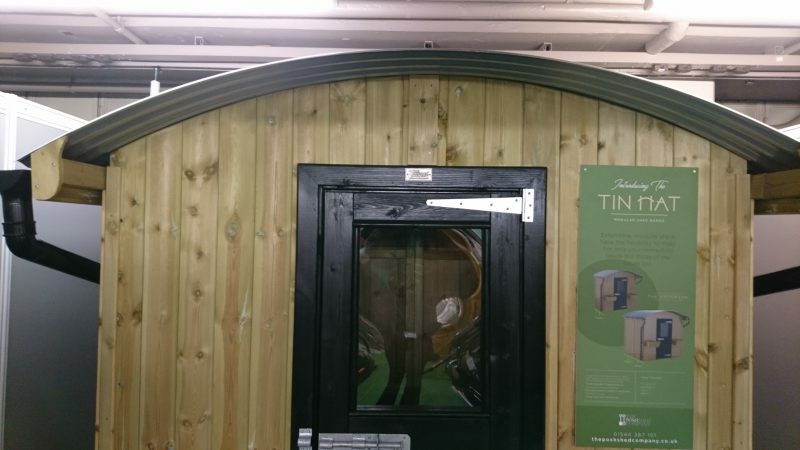 The Andersen has a curved corrugated iron roof, similar to Posy’s. The ‘Tin Hat’ Andersen shed from the Posh Shed Company. It costs £1,300. The Gardener shed with a corrugated iron roof from the Posh Shed company. It costs £2,865. Both The Gardener and The Anderson are compact garden sheds. Posy’s floor area is about three times the size, so comparing costs isn’t that relevant. When you build a shed yourself, you can have exactly what you want. You undoubtedly can save some money, especially if you re-use materials or do work yourself. But ordering a shed from a shed company is definitely quicker and less stressful. What colour should you paint your shed…? You can smarten up your shed with a coat of paint – so what colour would you choose? Here are some shed paint colour ideas. And here is more inspiration for revamping for your shed with paint. 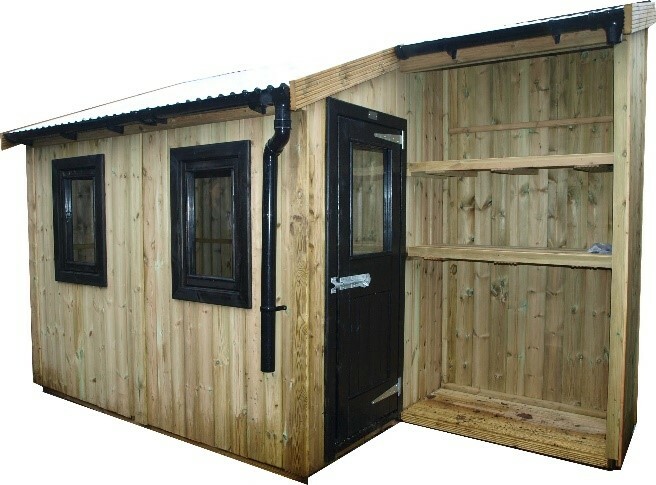 Read this post on buying a new garden shed. I think I can predict that we’ll be seeing more corrugated iron in gardens in the UK. 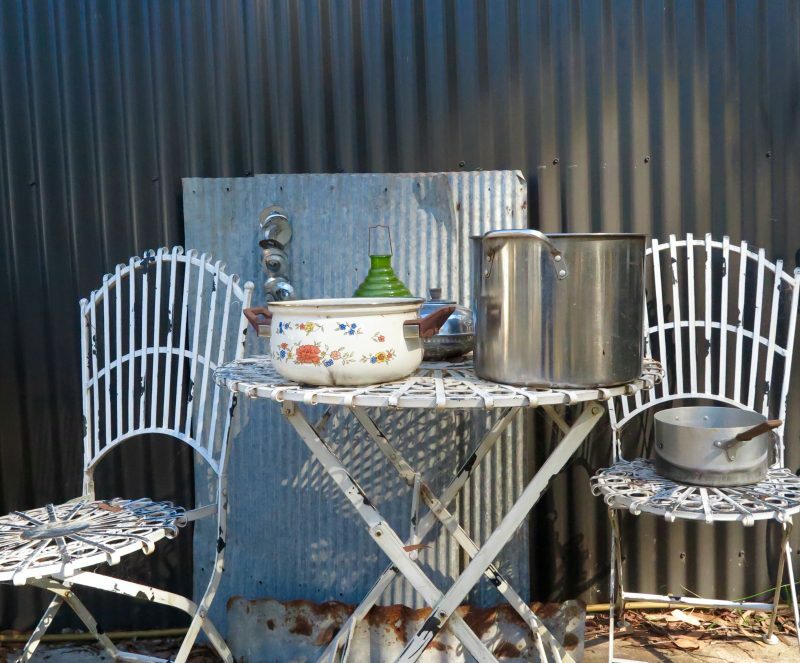 We all fell in love with vintage galvanised tin and aluminium, and the look is similar. 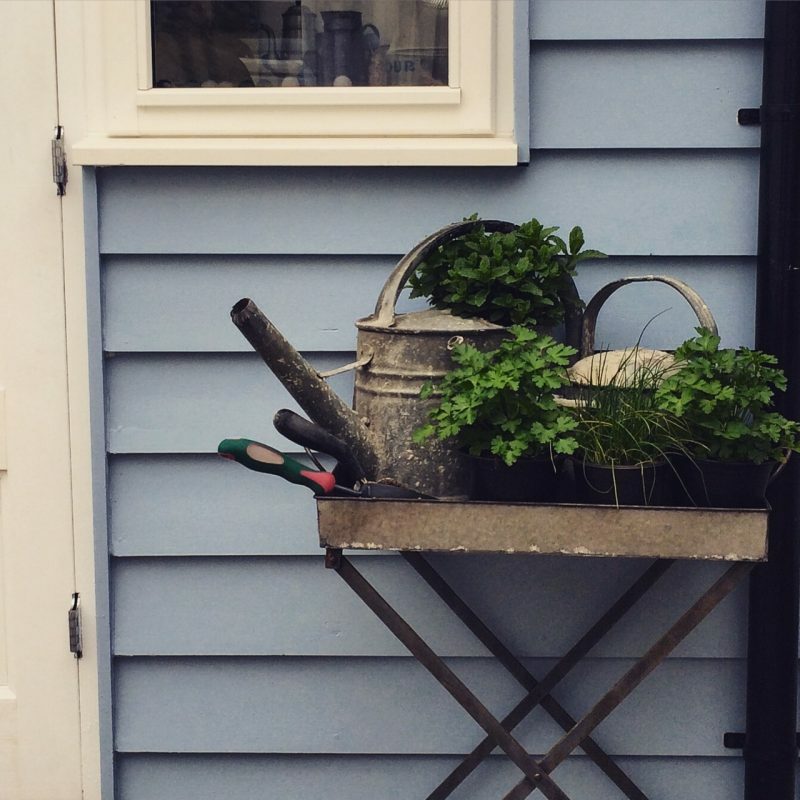 We all love vintage galvanised garden pots and tools. 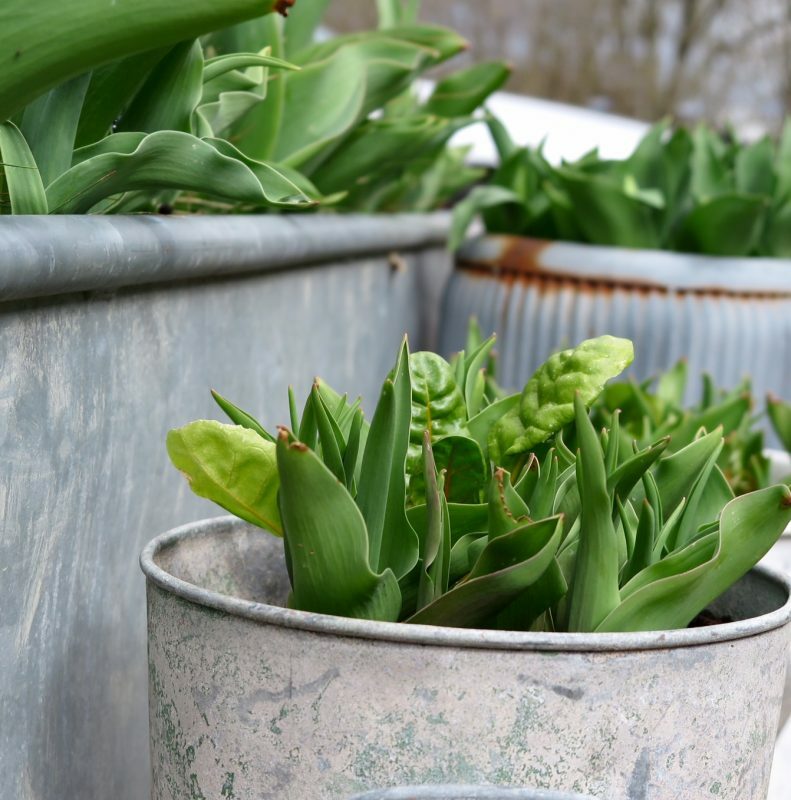 This galvanised trough and ribbed vintage ‘dolly tub’ planter have a similar feel to a corrugated iron shed roof. 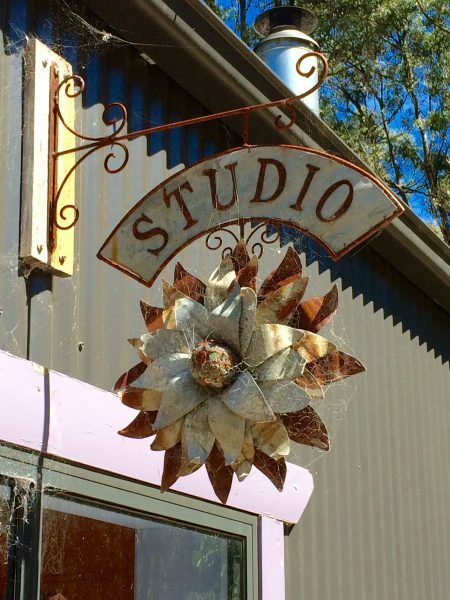 And I’m off to Australia again soon, so there’ll be more corrugated iron on this blog. I do think corrugated iron is beautiful…can’t wait to see more like this in Australia. Join us on the Middlesized Garden blog every Sunday morning. Just enter your email into the box on the top right, and we will whizz into your inbox as the sun comes up. Thank you! 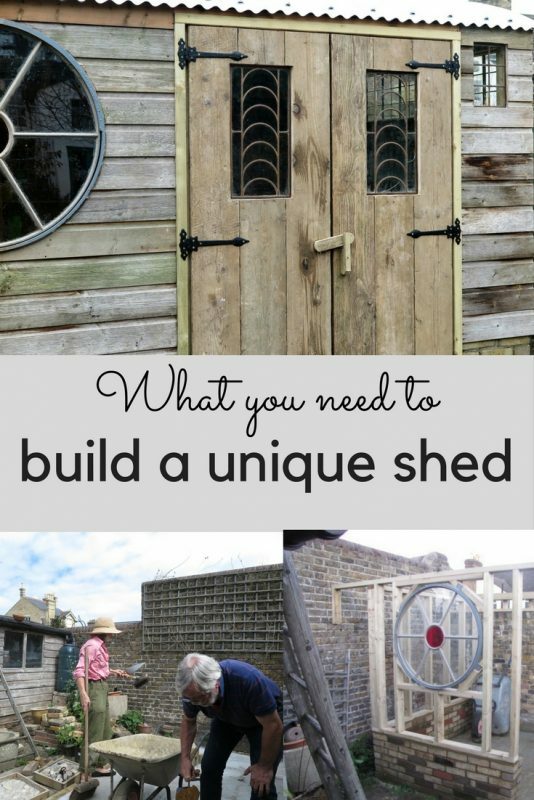 5 comments on "What do you need to build a unique shed?" A fantastic project, particularly when it brings loved ones together in order to complete it. It’s also fantastic to see corrugated iron actually adding to the aesthetic, rather than being an eyesore. Thankfully, there are a wonderful selection of options for roofing a shed. These include steel, iron, bitumen and even plastics. Personally, I think plastic should only be used as a cheap roof window. I hadn’t picked up that Monty has already got a corrugated iron shed – jealous!